This is the second part of my recalling the day that changed my life. To read the first part, about the days leading up to July 18th, 2006, click here. Below is what I wrote six years ago in the days following what happened. I want to preface the story by saying that this was a time when Tammy and I were in a bad place, a very bad place. We were separated and I wasn’t sure if I wanted to be married anymore. 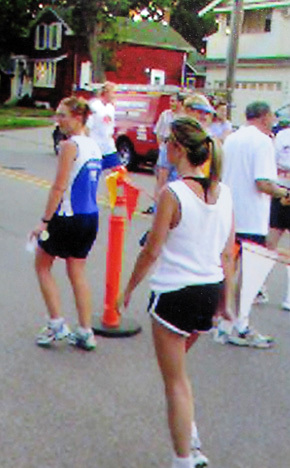 Dana, left, and Tammy after the race. At this point Tammy had no idea what she had done to me. Tammy had been running with a friend from work and they had been training to run in the Chicago Marathon later in the fall. They would run together after work and Tammy’s friend, Dana, had motivated her to continue to run further than Tammy ever had before. They had signed up to participate in a 5k (3.1 miles) race on July 18th. It was going to be Tammy’s first race and I knew I didn’t want to miss it. I didn’t think I’d be able to make it there for the start of the race since it was right after work on a Tuesday night. I just wanted to be able to be there to cheer for her when she crossed the finish line. It was as if time stood still that afternoon when I left work. I must have missed every red light on my way to the race because I even had time to stop and pick up some items for a “gift bag” to give Tammy after the race. I can look back at it now and see that was the first of God intervening in the events that were to unfold that night. Below is my account of what happened that night. Most of this was written the following day when it was still fresh in my mind. I have gone through it to make edits/modifications but the majority of what is below hasn’t been touched. It was very emotional for me to see her. I was there in enough time to see the race start. 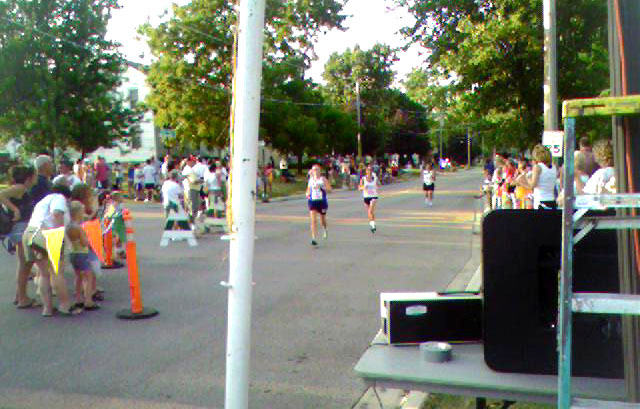 I was positioned by the finish line but to my left, up a little hill, was where the runners started. I tried to scan each face as the runners came down the hill and turned left to start down the course. I almost made myself dizzy because I was looking through the crowd so quickly, trying to pick out Tammy. Most of the runners had passed me and I began to think I had missed her. As I looked back up the hill to begin scanning the remaining runners, I spotted her. My eyes locked onto her and I couldn’t move. I stood there holding her little gift bag watching her and Dana come down the hill. I didn’t think she would see me because she had no idea I was going to be there for the start of the race since I had told her I’d be there to see her cross the finish line. As she got closer, I could see her looking at me. I didn’t know if she could tell it was me or not so I just stood there smiling, fighting back the lump that had formed in my throat. She recognized me all right as she smiled back and waved as she made the left turn and started the course. Once she made that turn, I couldn’t hold back the force inside me any longer and finally unclenched my jaw. My heart exploded with emotion as I turned away from the finish line with tears once again flooding my eyes and falling down my cheeks. Behind me, just down from the finish line was a river so I went down to the bank and I asked God what all of this emotion meant. I asked Him to give me a sign, to show me the true feelings in Tammy’s heart, so I would know the direction I’m supposed to go. I spent the next several minutes praying, it was actually more like begging, for God to give me a sign. I told Him that I needed it to be something that was obvious, that I would know when I saw it, that I wouldn’t question it or have to interpret it. I wanted something that would show me the way to go without a shadow of a doubt. I walked back up to the finish line. I waited like a nervous parent watching for their child’s headlights coming down the road on prom night. I kept watching, peaking past the row of people waiting for the runners, knowing that there was no way she was finishing that soon. I kept tearing up as I thought about seeing her cross the finish line (I’m tearing up now just thinking about it). I had brought my phone because I wanted to have a picture of her running in her first race and practiced taking a few shots of runners as they crossed the finish line so I’d be ready for her. The last time I remember looking at the clock was near the 32 minute mark and I figured they might be coming soon. I spent the next few minutes anxiously waiting and watching. I don’t think I stood still for more than two seconds at time. I remember looking down the street and I thought it was her and Dana, but when I looked at the shoes, I KNEW it was them. Tammy’s black shoes we bought at the beach earlier in the year gave it away. They were coming up to the finish line together. I raised my phone up and took a picture of them as they neared the finish line. I looked down at my phone and realized the image hadn’t saved, so I quickly tried to save it and get it ready for them crossing the finish line. After the runners finish the race, they are supposed to walk down a runway area where race organizers take their numbers so they can pair them up with their times. Dana walked down the runway, Tammy didn’t. She veered off to her left and shot through an opening in the barricade I was standing behind. She stopped right in front of me, put her hands on my face and kissed me. I just stood there in shock. God had touched her during the race and made her immediately come to me and show me the true feelings in her heart. I was frozen in the moment as I stood there watching her walk away with my jaw dropped. The feeling I had was so strange because my mind wasn’t racing with thoughts. Instead I was calm and peaceful inside. As I tried to compose myself to give her and Dana time to stretch and relax, I sat at a nearby picnic table and sent the pictures I had taken of her to her work email. After a few minutes I walked close to where they were stretching and she came over and hugged me as I busted out in tears again. God had already given me the sign I was looking for, but He wasn’t finished with me yet. He had one more trick up His sleeve. As I was telling her how I could know it was her by seeing her black shoes, she said something about her “big socks.” I had noticed they were too big for her and told her she should have gotten some running socks. Tammy: These are your socks. I wanted to have a piece of you with me when I ran. I wanted to wear your Georgia t-shirt, but it was too big on me now, so I went with the socks. Tammy, second from left, with her black shoes and big floppy socks. Another big lump appeared in my throat as I fought to suppress the tears that were welling up inside my eyes. My lips quivered as I tried so hard to be strong and not let her see all of the emotion that was bubbling just below the surface. When I couldn’t hold back anymore I grabbed her and hugged her again. Once I gained enough composure to where I could look at her and it not cause tears, I gave her the gift bag I had picked up with a card, Gatorade and some energy bars and told her she probably needed to get back to Dana. I hugged her again and told her how proud I was of her and started walking back to my Jeep. I was full of mixed emotions. I was busting at the seams with joy and happiness but sad that I didn’t have anyone to could share it with. Mom was having a party for James and I knew she wouldn’t be able to talk, or listen to me talk, about everything. So I sat down on a bench near the Jeep and send Tammy a text message telling her how proud I was of her and that she didn’t know how much the kiss and those socks meant to me. She truly inspired me. She had no idea that her actions would have such a deep and lasting on our marriage or on my life. She had worn those socks because she wanted to have a “piece” of me with her while she ran, not knowing if I’d even be there or if I’d ever come back to her or our marriage again. Little did she know when she chose those socks out of her dresser drawer that she was selecting a piece of her heart. But I knew. I knew that God had answered my prayers. He was already planning on having Tammy run the race in those socks, but He knew that it might not be enough. So, He gave me a two-for-one deal and had Tammy kiss me as soon as she crossed the finish line. I had asked for “obvious” and I got it. It was right in my face, literally. I didn’t have to think about what it meant or why it was done. I later asked Tammy about the kiss and she told me that she didn’t know where it came from. She hadn’t thought about it at all during the race but as soon as she crossed the finish line she had the urge to kiss me. I didn’t tell her at the time, but I knew who had caused that urge. I told her I was going to walk along the river by Joey T’s and she asked if I wanted company. We spend the next hour just talking about things, emotions, feelings, etc. It was an amazing night that I’ll never forget because I’ve never been so proud of her, or anyone else, in all my life. She accomplished something that she set her mind to do and I will never forget that. She showed me how much she truly cared for me by her actions last night and I could tell that she has changed and loves me more than I ever knew. That’s the end of my “story” from July 18th. If this were a movie it would have ended with this wonderful, happy ending. But this isn’t a movie. It’s my life. But I thank God that it didn’t end there. I’ll be the first to say that it hasn’t been all roses and rainbows since God answered my prayers. But I’ll also be the first to say that I know this is where I should be in my life and more importantly where God and myself wants to be. I’ve stopped running from things, stopped trying to fill that seemingly endless hole inside of me because God has done that. My life now is better that it ever has been. I thank God for caring enough for me to rescue me from myself despite all of the wrongs I had done, and will continue to do. My marriage has been so much more rewarding and I owe it all to God for touching my heart and showing me what love is really about. By no means do I think I know it all and I can’t say that I’m as good of a husband as I’d like to be. But I DO know that I plan on working on it everyday, with God’s help, and I’m not giving up on my marriage ever again. It’s been one year six years since “The Race” and I’m still so much in love with Tammy. I think about how much time I wasted with her, not knowing what love was. But I’m also so thankful that I now have the opportunity to spend time with her so I can show her what I’ve learned. I don’t know what the ending is going to be and quiet honestly I don’t really care. All I know is that I trust God’s plan for my life and our marriage and that’s all I need to know. He’s never going to give me or us more than we can bear and He’s always there for us. We both have seen Him work wonders within each of us and within our marriage and we will be forever thankful. All I know is that, God willing, I can’t wait to grow old with you Tammy. Gallery | This entry was posted in Daily Life and tagged daily life, humor, life, Love, postaweek2012, religion. Bookmark the permalink. You are a very bad man, Jason. I come to this blog to laugh, not to cry! You had me at “big socks”! I’ve been venturing off the “normal” path recently and some of my stuff hasn’t been fun. It is a great story. It still makes me tear up when I think about it. Darn you. Thank you for putting yourself out there like this and for sharing it with me.